Just about every physics and astronomy textbook in existence contains a neatly formatted table of physical constants. These numbers are usually taken to be immutable parameters of the Universe, and we base all of our physical calculations on this assumption. We then might ask ourselves, are these fundamental constants actually static across time? That is, have the values of these constants remained the same between now and the early ages of the Universe? To investigate the possibility of these constants being time-varying parameters, we have to make observations of physics happening in the past. Fortunately, this is possible due to the finite speed of light, as any observations of distant astronomical objects manifest as observations looking back into an earlier time in the Universe. Any variations in the fundamental constants of nature should produce observational signatures inconsistent with our present day knowledge of physics, and this should yield different values for physical constants from our experimentally determined ones. In this paper, the authors investigate the consistency of the fine structure constant across the lifetime of the Universe. The fine structure constant, or , is a dimensionless quantity describing the strength of the electromagnetic interaction. Remarkably, the agreement between the experimentally measured value of with its theoretically predicted value from quantum mechanics agrees within one part in 10 billion. This stringency in agreement represents one of the most remarkable successes of theoretical physics, and is analogous to predicting the distance between Los Angeles and New York and being correct within hair’s width. 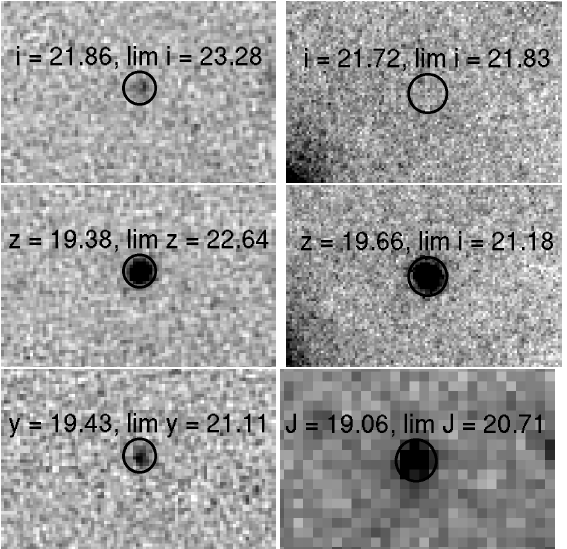 The authors take spectra from quasi-stellar objects (QSOs, or quasars) to probe variations in . QSOs are extremely luminous and distant galaxies with active galactic nuclei, and represent some of the most distant objects in the observable Universe. Specifically, the authors make spectral observations of the [O III] emission line to measure variations in . The [O III] line is a common feature of QSOs resulting from doubly ionized oxygen, and is characterized by a doubly peaked emission at two closely spaced wavelengths. An observation of a QSO with a given distance and redshift corresponds to a particular time earlier in the Universe, so this allows us to make measurements across a wide span of cosmic history if we observe a collection of targets. The paper uses data from the Sloan Digital Sky Survey, from which a sample of QSOs are analyzed after passing a set of selection criteria. The objects of interest are selected based on the quality of their [O III] emission line. For very high redshift objects, this line lies in a wavelength regime that can be potentially contaminated by other emission lines from the sky. Additionally, the authors select objects whose [O III] emission has a strong signal-to-noise ratio, separate and well-defined peaks, and no contamination from neighboring emission lines from other elements. The final selection of QSOs contains 2347 objects, and this large sample helps eliminate any significant sources of systematic errors. To measure from a QSO spectrum, the authors determine the wavelength difference between the two emission peaks of the [O III] line and check for any significant changes of this separation with time. 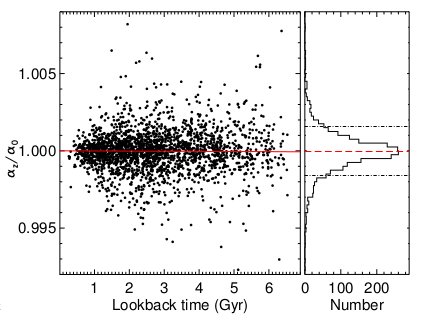 The best-fit line of versus the lookback time shows that there is no significant variation over the past 7 billion years within an accuracy of 10 parts in a million (Fig. 1). This result is consistent with previous measurements based on the same method, and also presents an improvement in precision due to the larger sample size. While this suggests that the fine structure constant lives up to its name, there is still some speculation that and other constants might actually vary over time. Systematic errors? Normally a large sample would reduce statistical errors – am I missing something? You’re correct that the largeness of the sample by itself doesn’t rule out systematic errors. It does, however, when combined with certain other considerations, suggest that systematic errors are not significant. The line of reasoning here is as follows: in comparing their study with the previous study using QSOs, the authors (H. Rahmani et al.) found that their results had a smaller margin of error, and that the magnitude of the error-reduction was roughly what one would expect if statistical errors dominated. This suggests, though admittedly it does not prove, that the main source of error here is statistical rather than systematic. I forgot to mention that the previous study used a much smaller sample than the present one; sorry for the omission.